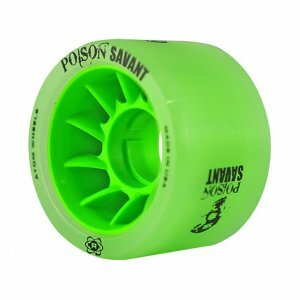 ﻿ Atom Poison Savant Wheels - $30.00 : Bruised Boutique, For Derby. By Derby. Love Poison grip but want more roll?... Say hello to Poison Savant! What could possibly make Atom's Poison, one of the top performing wheels in the industry, any better?... Our exciting NEW SAVANT core of course! First, we start with Savant, featuring an oversized core with a molded lip. The oversized core not only reduces weight but increases the overall roll (speed). With the increased speed the molded lip plays a big role in ensuring the grip characteristics remain! Then we wrapped that puppy in our famous Poison urethane. Poison provides awesome grip without that 'sluggish marshmallow' feeling which allows for more roll. Poison Savant is perfect for: Outdoor tracks, Slick Sport Courts, Bank Tracks and Dirty Wood Floors.